After America entered World War II following the Japanese attack on Pearl Harbor, the US government incarcerated large numbers of Japanese Americans in the mistaken belief they presented a threat to national security. Over 110,000 people, most of them US citizens, were rounded up, mostly from population centers on the Pacific coast, and forcibly relocated to incarceration camps in the western interior. In her latest book, Nature Behind Barbed Wire (Oxford University Press, 2018), Professor of History and Environmental Studies Connie Chiang considers a new aspect of the story: the environmental history. The political and social histories of the Japanese American incarceration have been pretty well covered, but I want to show that this was in many ways an environmental story. Pick up just about any book or memoir about the episode, and you’re likely to find descriptions of how isolated the camps were, how dry, dusty, and windy the conditions, how extreme the temperature range was. The incarcerees were largely from the coastal Pacific communities of California, Washington, and Oregon, where the climate is more temperate, so this was an alien environment. A good chunk of the book is about how the physical environment shaped the camp experience, both for the incarcerees and the government officials who administered and maintained the camps. The location of the camps was a key factor, of course. There were ten of them, built in remote areas away from the coast, away from large urban areas and military installations. These “relocation centers,” as they were officially called, were in California, Idaho, Utah, Arizona, Wyoming, Colorado, and Arkansas. They weren’t completely isolated, however, as they needed to have electricity, water, and sewage services, as well as transport links. A lot of environmental histories have tended to deal with obvious topics like rivers, lakes, forests, and other conservation or resource-related issues. Recently, however, environmental historians have started looking at well-known subjects and considering them from an environmental perspective. To me, the Japanese American incarceration story was in some ways an obvious choice, hidden in plain sight, for an environmental story. 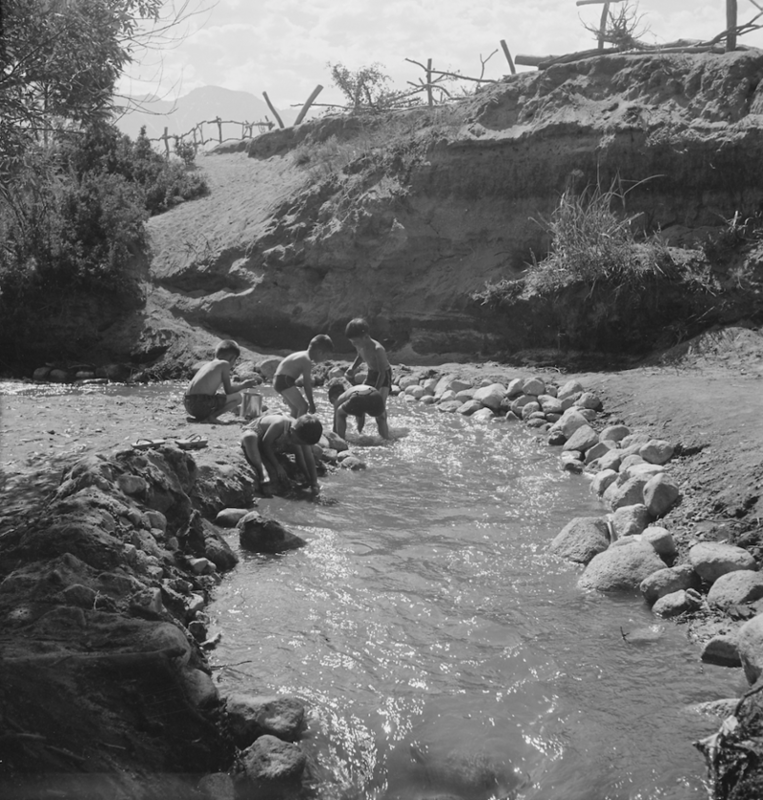 Japanese American children cooling off in a creek that bordered the Manzanar camp, July 2, 1942. Photograph by Dorothea Lange. Courtesy of the National Archives and Records Administration. What was life like behind the wire? To be clear, conditions in the US camps, while austere, did not compare with the horrors experienced by many during the war—for example, those who suffered in the Nazi death camps in Europe or some of the prisoner-of-war camps run by Imperial Japanese forces in the Far East. Nevertheless, the incarceration of Japanese Americans has justifiably been described as one of the most egregious violations of civil liberties in the US history, with thousands of families being forced away from their homes and made to live in difficult conditions for several years. Incarcerees were given food and basic provisions by the federal government, but if they wanted anything more, they had to buy it themselves, which meant working for it: most of them did work, performing a variety of jobs around the camps, and were paid a pittance of between 12 and 19 dollars a month, depending on skill levels. Despite what happened to them, nearly all the incarcerees continued to regard themselves as American. Some even accepted their time in the camps as their patriotic duty. Many others, of course, were also angry about having their freedom taken away and there was resistance. Both camps in California had riots. 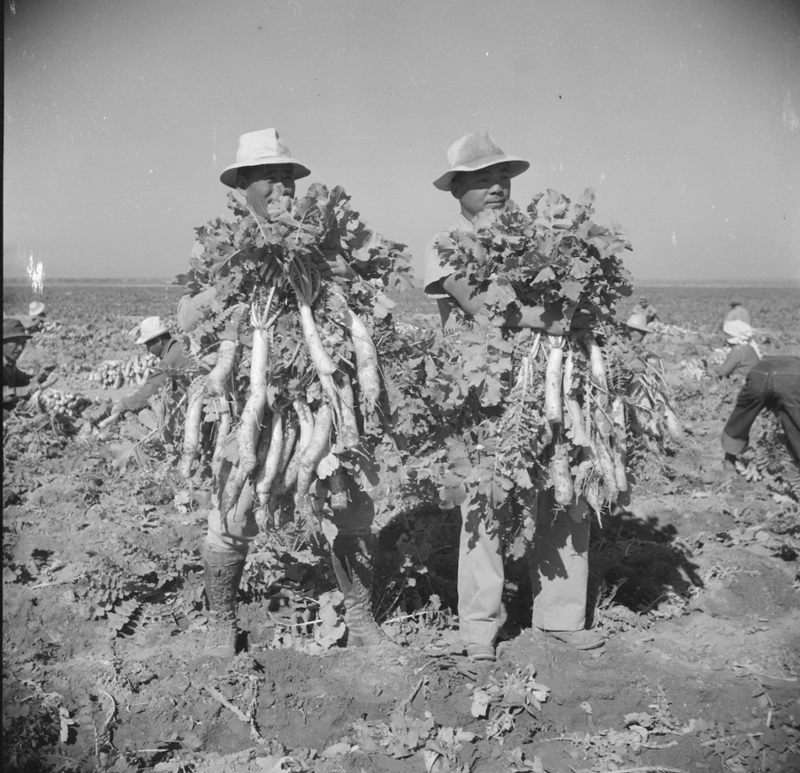 Japanese American workers harvesting daikon at Gila River, November 25, 1942. 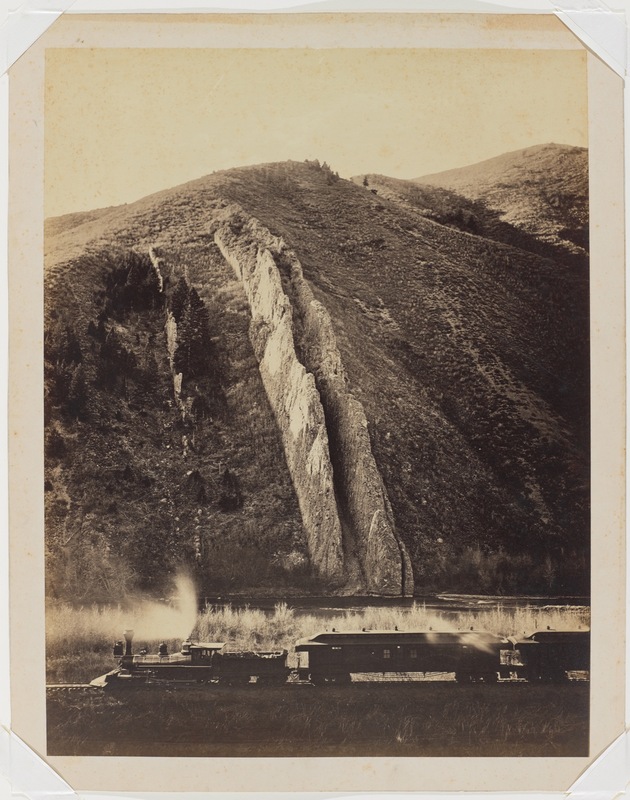 Photograph by Francis Stewart. Courtesy of the National Archives and Records Administration. Most of the Japanese Americans who had been incarcerated had to start from scratch again once they were released. If they were business owners, they might have been lucky enough to be able to entrust their assets to someone else when they were gone, but they were in the minority. 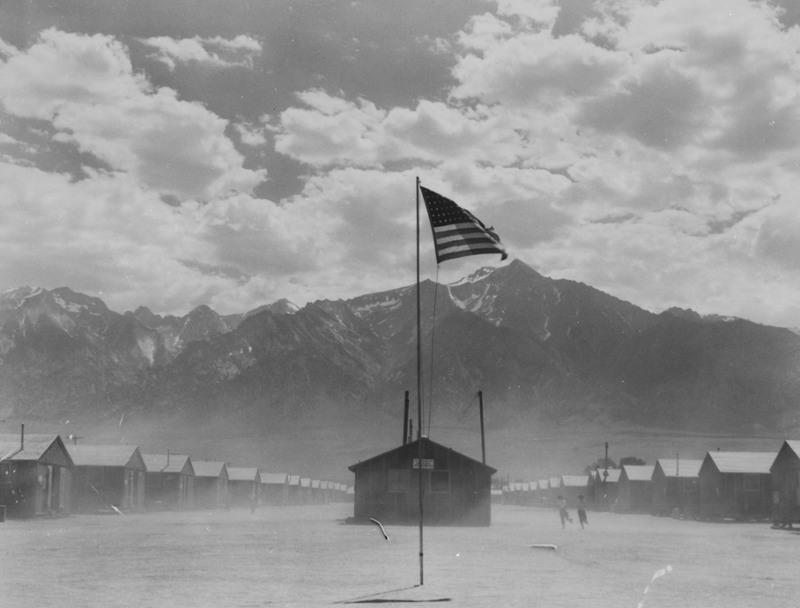 Many Japanese Americans did not want to talk about the incarceration experience after the war, preferring to try and forget the trauma they had suffered. It wasn’t until the late 1960s and early ’70s that a more active generation wanted some answers about what happened. The federal government carried out an exhaustive study, published in 1988, that concluded that the Japanese American community had presented no real threat during the war and the incarceration was unjustified. That same year, a formal apology was offered and compensation was paid to survivors. Dust storm at Manzanar, July 2, 1942. Photograph by Dorothea Lange. Courtesy of the National Archives and Records Administration. What sources did you use for the book? There’s a lot of material available online about the incarceration experience, including extensive oral histories from camp survivors. I also made several trips to the National Archives in Washington, DC, going through boxes and boxes of records from the War Relocation Authority, the federal agency that administered the camps. Environmental factors continue to resonate today in ways that people remember the camp experience. Some of the camps have been preserved as national historical sites, and many of their administrators still emphasize the materiality, the physicality, of Japanese Americans’ wartime experiences: the dust, the heat, the cold—it’s still something that is seared in their memories. 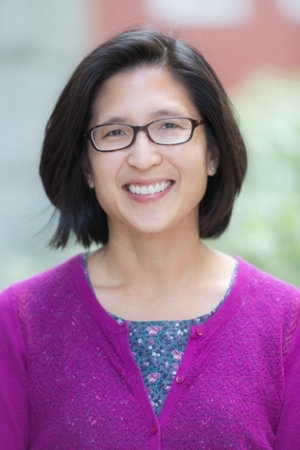 Professor of History and Environmental Studies Connie Chiang will be leading a book launch and discussion at 4:30 PM in the Nixon Lounge of the Hawthorne Longfellow Library on Thursday, December 6, 2018. Don't We All Come from Somewhere? 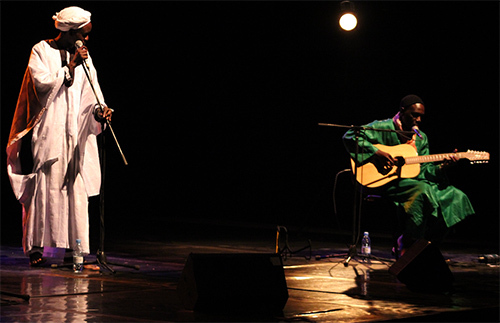 Three renowned Senegalese storytellers and musicians will present "Voyage without a Visa (Tukki saa suné)" in Kresge Auditorium on the evening of Tuesday, February 25. 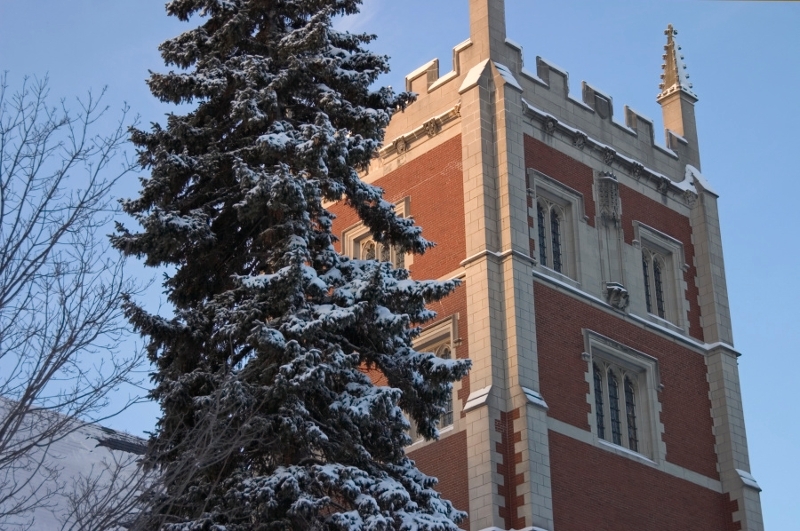 Two Bowdoin professors are promoted to tenured positions, while a third scholar, currently at University of Puerto Rico, prepares to take up a tenured appointment. In conjunction with a new exhibition at the Bowdoin Museum of Art, a historian, a biologist, and an art historian discussed the interdisciplinary intersections of art and the environment. 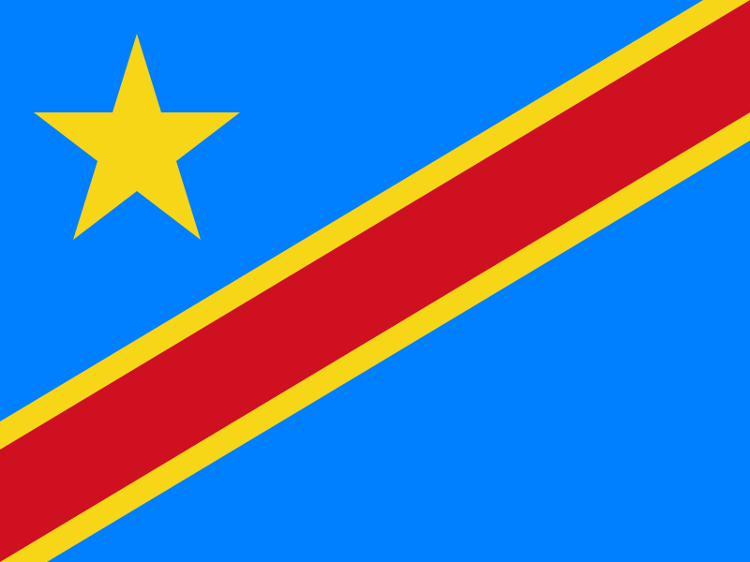 For the first time in its fifty-nine year history, the Democratic Republic of Congo may be about to experience its first peaceful, democratic transfer of power. Professor David Gordon explains the perils and possibilities.